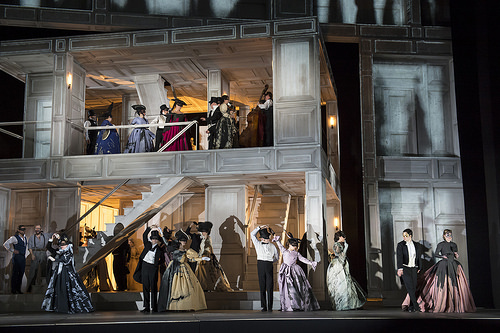 Having missed Kasper Holten's production of Mozart's Don Giovanni when it received its first outing at Covent Garden, we went along to the Royal Opera House on Thursday 18 June 2015 to catch the production during its run this time. Christopher Maltman sang the title role, with Alex Esposito as Leporello, Albina Shagimuratova as Donna Anna, Eric Halfvarson as the Commendatore, Rolando Villazon as Don Ottavio, Dorothea Roschmann as Donna Elvira, Julia Lezhneva as Zerlina, Nahuel di Pierro as Masetto and Charlie Blackwood as Donna Elvira's maid. Kasper Holten directed, with Amy Lane as revival director set designs by Es Devlin, video designs by Luke Halls, costumes by Anja Vang Kragh, lighting by Bruno Poet, choreography by Signe Fabricius (revived by Miles Hoare), with Alain Altinoglu conducting. One of the most striking things about the production is that Es Devlin's two story set is used as the backdrop for a series of video projections by Luke Halls. Whilst the set does rotate and provides immense flexibility, on top of this the visual setting is constantly in flux with the video. Some of these are stunning and others distracting, starting with the gradual projection of Leporello's list during the overture. Ultimately, I found the busy visual overlay a little distancing, and it did not help that by using the cube structure of the set as the location for the action Kasper Holten rarely had the singers coming all the way down-stage so the musical image had a certain distance too. Kasper Holten takes what we might call a modern view of the opera. Donna Anna is clearly complicit, and during the opening scene can clearly see who Don Giovanni is, so that the piece becomes about her conflicted feelings rather than simple vengeance. At the end, the ensemble is omitted leaving Don Giovanni alone in a mental hell of his own makings. Though set in a non-place, there was a very clear visual distinction between the gentry, the servants and lower classes which is essential to the piece but often missed nowadays. Ultimately, you felt that not only was Kasper Holten not charmed by Don Giovanni, but there was a hint of puritan disapproval. The set is inhabited by what seem to be the ghosts of the Don's previous conquests. And I certainly felt uncomfortable in the fact that the only person to disrobe in the entire opera, was Donna Elvira's maid (Charlie Blackwood) who disrobed instantly after one look from the Don! The production has a restless, slightly predatory feel, as the cast all prowl around the set. Its multiple levels and staircases offered plenty of opportunities for eavesdropping, and evading people . Christopher Maltman's Don Giovanni, in particular, seemed to spend a lot of time lurking, overhearing other characters in their scenes. It brought out the sense of the arch manipulator. Christopher Maltman was suave and vigorous, but without quite the magnetic charm that he sometimes brings to the role. This was a very complex, fully rounded Don Giovanni but one who was not, ultimately, very likeable. This was exacerbated by the fact that the comedy between Christopher Maltman and Alex Esposito's Leporello had rather a hard edge to it. Rather than diffusing tension, the almost commedia del arte violence tended to notch up the tension. Comedy, when it came was in the form of physical knock about which seemed at times inappropriate. That said, Alex Esposito was brilliant as the rather lugubrious servant. The drama however seemed a little under cooked at first, and the first act was very slow to catch fire. Partly, I think that this was the speed of the recitatives. Whilst Alain Altinoglu took the arias and ensembles and a nice lively pace, the recit seemed to be done in a more ponderous fashion. But the feel of the drama (or lack of it) was also down to the casting. Albina Shagimuratova made a poised and profoundly musical Donna Anna, but she is more of a lyric soprano than dramatic though she brought a nice edge to her arias. Musically, I have rarely hear the role better sung, but there was an element of icy perfection about this Donna Anna. I am old enough to remember the way it was common to cast heavier voice sopranos in this role, and whilst lighter ones work, where Albina Shagimuratova let me down was in the lack of vehemence and dramatic vigour in her performance. But as the character, as played here, was so conflicted perhaps that was deliberate. The effect of this casting was to give a stronger sense of balance between Donna Anna and Donna Elvira, with Dorotea Roschmann bringing real dramatic intensity to Donna Elvira. Here really was an intense woman scorned, and in her arias she used every trick in the musico-dramatic book to give us a performance which as vivid in its portrayal. A third, surprising, element to the casting was the vividly vigorous Don Ottavio of Rolando Villazon. Rolando Villazon's voice did not have the surface sheen it once had, but he used it with style and intelligence. Both arias were done in a highly satisfying manner, and he made Don Ottavio seem more robust than usual, which was very welcome. Julia Lehzneva has a very distinct voice, quite unmistakeable and whilst she made an intriguing Zerlina, I am not sure I could see her yet moving into one of the other roles. She certainly sang the more florid passages with ease and flirted shamelessly with both Christopher Maltman's Don and Nahuel Di Pierro's Masetto. Nahuel Di Pierro proved a robust and vigorous Masetto. Eric Halvarson was a dark voiced Commendatore, constantly prowling the set as a ghost throughout the remainder of the production. Alain Altinoglu drew lively and lithe playing from the orchestra, and gave us modern style without driving the speeds to much. But this is a production which does not yet seem to have quite found its focus, so the strong individual performances did not for me add up to a cohesive drama.